King Harbor Abel Brown - AoM: Beer et al. 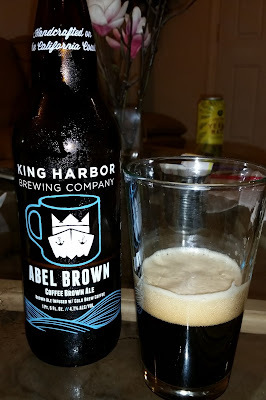 After having the King Harbor The Quest w/Citra, my friends and I split a bottle of King Harbor Abel Brown. Michael started by commenting, "It smells like coffee," to which I said with a smile, "Because it is." 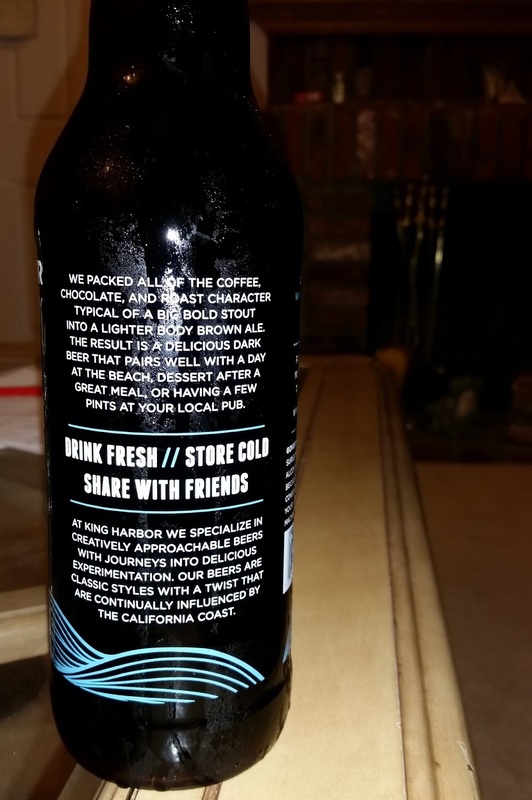 Giving the beer a whiff of my own, I thought it had a malty, coffee smell. The Beer: Abel Brown (aka the breakfast beer, aka the dark beer brewed for the beach) is an American style brown ale that is blended with a cold brew, medium roast, single source, Arabica bean coffee. The aroma is fresh roasted coffee. The taste is a balance of coffee and mild chocolate/toasted characters with a subtle cinnamon note on the end. Abel Brown delivers all of the flavors of a stout or porter, but in the medium body and clean finish of a brown ale. The Story: Abel Brown is a character in an old sea shanty about a sailor trying to convince a fair maiden to let him crash at her house. We assume that Abel had a few pints before the story begins and he probably needed to keep his palate wet while the story goes on, but he also couldn’t get too drunk since he knew this was going to be a long mission. So we made the educated guess that his brew of choice would have been a lower ABV, coffee blended ale, that didn’t weigh him down and kept him feeling refreshed. Cheers to you Abel Brown!